Prevents osteoporosis, and muscle weakness. A week hardly passes without one or more studies being published about the risks of vitamin D deficiency or its health benefits. ¤ Vitamin D has long been associated with healthy bones. But scientists are finding increasing evidence of its fundamental role in cell division and differentiation and its effects on the immune system. Inadequate vitamin D levels are linked to almost all age-related problems, including increased risk of fracture, cancer, vascular disease, diabetes, Parkinson’s disease and chronic inflammation. Conversely, higher vitamin D levels show a clear correlation with reduced incidence of colds, flu and other infections. ¤ According to the French study SUVIMAX, the average diet provides only 136 IU of vitamin D, mainly from oily fish such as mackerel, herring and salmon (400-800IU/100g); shellfish (200-300IU/100g) or tinned sardines (100IU/100g); thus relatively small amounts come from the diet. Two-thirds of our vitamin D is in fact manufactured by our bodies, on fine days when the sun’s UVB rays interact with a cholesterol derivative called 7-dehydrocholesterol. However, in order for the body to produce optimal levels of vitamin D, the arms, torso and legs should be exposed to the sun for 10-15 minutes a day, at midday, from March onwards, otherwise levels of UVB are too low, and levels of UVA are too high. In addition, in summer, effective radiation can amount to no more than 80% of total radiation due to various degrees of cloud cover. From October, exposure to UVB is too low – even a winter sports holiday will not provide enough exposure for the body to produce this valuable vitamin. ¤ Deficiencies in vitamin D are therefore all too frequent: Western populations, in countries such as France, Belgium, the United States, Switzerland and Canada, have inadequate levels of vitamin D, especially during the winter. In most developed countries, daily recommended amounts are too low to provide health protection. In France, for example, the amount recommended for an adult is woefully inadequate, set at just 200 IU (5 µg) a day. In reality, vitamin D requirements are 10 to 25 times higher than this, as the body can use up to 5000 IU a day. ¤ In 2007, 15 researchers, biochemists, doctors, epidemiologists and public health specialists criticized such recommendations for having led to marked deficiencies in vitamin D in populations in the Northern hemisphere. These researchers estimated that the requirement for vitamin D was close to 1000 IU a day. At the beginning of 2010, 40 international scientists launched an appeal to increase awareness among doctors of the importance of vitamin D in preventing osteoporosis, heart disease and cancer. They recommend these populations supplement their diet with 1000-2000IU a day, particularly from October to March, ie during autumn and winter, to adequately meet their needs for vitamin D.
¤ From autumn onwards therefore, it is advisable to boost your serum 25(OH) D3 and aim for 30-60 ng/ml (75-150 nmol/ml), given that studies show levels of at least 52 ng/ml are needed to provide optimal protection against breast cancer, for example. • Living in a town or area with atmospheric pollution, as SO2 absorbs UV rays. • ‘Covering-up’ all year round. • Having highly pigmented skin (being tanned, having dark or black skin). • Being over 70 - D3 production is four times lower by this age, as the skin has become more delicate. • Being overweight as D3 is stored in fat cells. • Regular use of anti-UVB sun creams (with an SPF > 15), since they can reduce the amount of UVB penetrating the skin by 99%. • Relying on getting UVB exposure through the window (a conservatory for example), because the glass absorbs almost all the UVB. • Not eating enough oily fish (at least once a week). • Taking too little exercise outdoors. • Having frequent ill health (repeated colds). • Taking anticonvulsant drugs, corticosteroids or anti-retroviral drugs. • Suffering from kidney or liver failure, hyperthyroidism, Crohn’s or coeliac disease. Research suggests that a daily dose of 5000 IU could have multiple health benefits for the vast majority of the population. This is also the dose recommended by the Vitamin D Council. It can be used safely even at doses as high as 10,000 IU/day. Taking these kinds of doses every day can reproduce the benefits of daily exposure to the sun, and in particular, dosage can be adjusted as necessary, since requirements will differ from one person to another. Vitamin D3 is naturally a fat-soluble vitamin. While the dry form does exhibit activity, the oil form has been shown, in a number of users, to be better absorbed and to have great bioavailability when used on a lipid base. Comparative blood tests have shown an appreciable increase in 25(OH)D3 levels from the oil form compared to the dry. 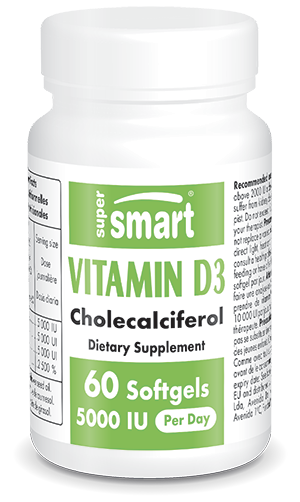 We have therefore introduced this improved-delivery vitamin D3 5000 IU so that everyone can choose the dose and form which suits them best. The beneficial effects of vitamin D3 can be boosted by other substances including certain vitamins. While vitamin D facilitates calcium absorption in the gut, vitamin K helps by distributing calcium throughout the body. As a result of their complementary benefits for bone mineralisation, these two vitamins are now combined in the formulation MK-7 + D3. The protective and beneficial effects of this nutritional supplement mean it is particularly recommended for older individuals, those suffering from osteoporosis and those at risk of bleeding or cardiovascular disease. The protective effects of these vitamins can be boosted by the antioxidant benefits of coenzyme Q10, a substance considered to be a key nutrient for protecting vital organs such as the heart and brain.